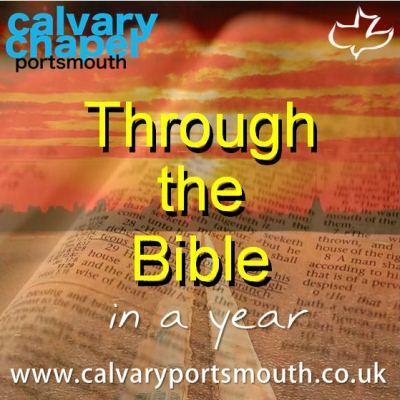 This study, taught by Pastor Barry Forder, is the 42nd session of our ‘Through-the-Bible-in-a-Year’ series recorded during 2014 as part of our Sunday morning family services. In this study we review Paul’s letters to the Thessalonians. Paul spent just three weeks with the believers at Thessalonica, yet taught them more about the ‘end times’ than most churches today teach in 30 years! Why? Because this isn’t a trivial side issue for prophecy buffs, this is something essential for all believers – especially new converts, as they were in Thessalonica. We have a great security in Christ that should separate us from the world; we know the answers to life’s big questions; we know where we are going when we die. So we need not sorrow as those who have no hope. We have the promise that Jesus will return and ‘catch us up’ (4:17) to be with Him before He pours out His wrath on this unbelieving world (5:3). Paul would not have these precious converts ignorant (4:13), they needed to know, and they needed to walk unblameable in holiness before God (3:13). Although it comes mid-way through the New Testament 1st Thessalonians is actually the first letter Paul wrote, and much like we see in all of Paul’s letters, there is an underlying theme of the need to be sanctified (set apart from the world & set apart for God) (4:3). Following hot on the heels of his first letter, Paul again writes to the new believers in Thessalonica. In his first letter Paul had laid a solid foundation of doctrine, with particular emphasis on the Rapture of the church and the coming Tribulation. However, apparently they had received a letter purporting to be from Paul that was in fact a forgery. Whatever this letter had said had unsettled these believers. Within a year of receiving Paul’s original letter, persecution had begun, which some were now saying was the Tribulation. If the Tribulation had begun, the obvious conclusion (based on what Paul had already taught them) was that they had missed the Rapture! So now Paul writes to them again to comfort them; he explains that the Tribulation (‘that day’ 2:3) will not come unless there come a ‘falling away’, and the man of sin (whom we refer to as Antichrist), is revealed. Furthermore, Antichrist could not be revealed until ‘the Restrainer’ (Holy Spirit/Church) was removed (2:6-7). Thus Paul opens acknowledging the present distress (ch1), gives the timing & order of events (ch2), and closes with a call to work for the night is at hand (ch3).